Key property markets in Vancouver and Toronto, which has been struggling, could be the next casualties as the diplomatic spat between China and Canada that broke out in the wake of the arrest of a Huawei executive keeps intensifying. Top Chinese real estate agencies have canceled some Canadian real estate investment promotion events, and some sensitive investors have given up their buying plans, industry sources said. Canada's detention of Huawei CFO Meng Wanzhou has caused a diplomatic spat between the two countries. The tensions could empty key property markets in Canada, such as Vancouver, of Chinese real estate investors, housing agents said on Sunday. 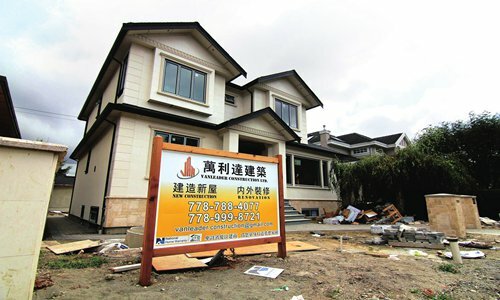 A department head of the Canada branch business of a top real estate agency in China told the Global Times on condition of anonymity that the agency canceled some Canada promotional events and encouraged potential new Chinese investors to start shifting their migration destinations or delay their investment plans. "A few sensitive investors dropped their plans ... about 10 percent," the agent based in Beijing said. "Some investors are delaying their plans, considering the spat to be a temporary incident." A 28-year-old Chinese surnamed Lu who has studied and lived in the Canadian city of Montreal for eight years, told the Global Times on Sunday that she is reconsidering her plan to buy a house after the incident involving Meng. "I have scheduled a time to submit my immigration application, but I'm thinking of postponing it as well as my plan to buy a house in Canada because I'm disappointed with the Canadian government… I don't understand why the officials are meddling in political affairs between China and the US," Lu said. The anger has spread among the Chinese community in Canada, which had already lost faith in the economic policies of Prime Minister Justin Trudeau's administration, according to Evan Tang, a real estate broker in Toronto, traditionally a hotspot for Chinese property investment. "As December is generally a low season for the Canadian property market and dealers and potential buyers are usually on vacation, we have not witnessed a significant change so far," Tang told the Global Times. Chinese investors have been seen as a major force driving up key Canadian property markets' housing prices in recent decades. But prices have experienced corrections due to foreign buyers' taxes that British Columbia province introduced in 2016. Greater Vancouver's home sales dropped 42.5 percent in November, compared with the same month a year earlier, according to the local real estate board. Wang Lunwen, CEO of Sky Migration, told the Global Times that Chinese enthusiasm to invest in Canadian property has already been cooling, after the Canadian government tightened its immigration policy and slapped an additional 15 to 20 percent property tax on foreign buyers - most of whom are Chinese. "The detention of Meng has tarnished the country's image among Chinese, which will further reduce its attractiveness in terms of investment," Wang added. A slowdown in the Canadian housing market - which accounts for 7.6 percent of its GDP, based on a report by Moody's - could potentially weigh on the country's economy, industry insiders pointed out. For example, unlike the titanic Chinese developers, the Canadian real estate market is characterized by smaller and fragmented local developers that are much more vulnerable to downturns. "If home prices stop soaring, developers would experience slow capital returns and have a hard time borrowing from financial institutions," said Wang.